Recording information to Blu-ray was once a laborious and painstaking process. Slow speed times meant for some impatient waiting. A new wave of BD recorders look set to change this, and Buffalo's new external and internal units are at the top of the 'speed' list. Boasting a Blu-ray write speed of 8x, the drives are so fast that even the latest burnable discs will have a hard job keeping up. If you use the unit as a normal DVD burner, then this speed doubles to 16x. 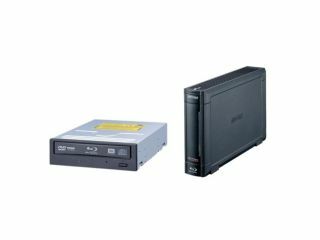 The drives are built around Panasonic SW-5584 units and are SATA-based and can record to both single and dual layer Blu-ray discs. Connection on the external drive is USB2.0. Included in the package is CyberLink PowerDirector 7 software, which should make the transition from DVD to Blu-ray burning that little bit easier. The drives will labelled the BR-816SU2 (external), and the BR-816FBS-BK (internal) will be available in Japan early August for around £200.